A photo of my girl Nancy in the fall. 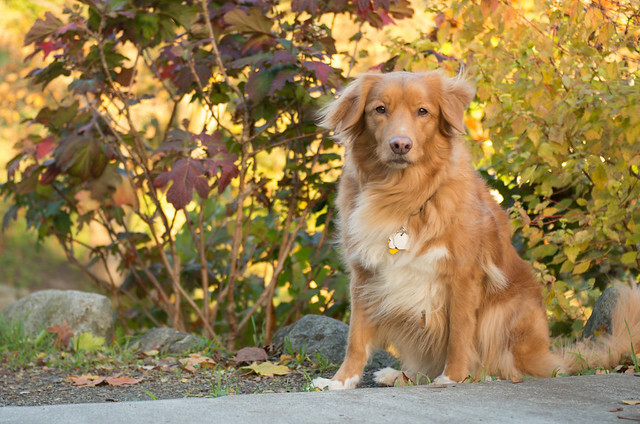 Nancy is a beautiful dog, shot looks great with the the fall background. Thank you! She's a sweetie....and a goofball. Cute dog with a mischievous glint in her eye. Beautiful photo....almost like a painting. Well done. BTW, I have the 40mm Limited as you used for this photo. I'm always impressed with quality of this fine lens. Yeah, I really enjoy the lens (and the dog). I have always wanted the 43/1.9, but this was a marketplace bargain and it can capture some really nice things. Nancy is very dramatic and I've taken hundreds of shots of her. I'll admit that this one was a tiny bit posed, but only a little. She was waiting at this park while my son was playing and I just positioned myself around until she was framed just right.